Glen was born in Calgary in 1963, raised in Montreal and moved to Hamilton in 1978. Married to his high school sweetheart Michelle, with two adult daughters and two grandsons, family life provides the strong foundation for Glen’s happiness and success. A career as a professional IT consultant for more than twenty years, has provided Glen with a stressful and interesting set of work challenges. This career has defined his approach to leadership, working hard to build an environment where people can excel, work as a supportive team, and get things done. Masonry has provided a refuge from the daily stresses of life. The ritual, the fellowship and the harmony of the Lodges are touchstones which help maintain work-life balance. Initiated into Temple Lodge No. 324 in 1997; Glen first served as Master in 2008, and completed a second term in King Solomon's Chair this past masonic year. Thanks to the patience and support of his wife Michelle, has been able to devote time and energy to Temple Lodge, the Holy Royal Arch Masons - Ancaster Chapter No. 155, is a member of the Scottish Rite, 18th degree, and has served as District Chair for Lodge Resources and for Masonic Education. 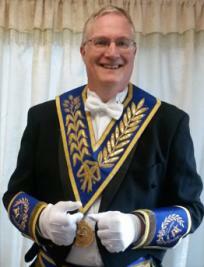 Glen would like to express his thanks to the brethren of Temple Lodge No. 324 for their nomination to the office of District Deputy Grand Master and to the Brethren of Hamilton District C for electing him to serve for the upcoming year. It will be a privilege to work with the Worshipful Masters, District Chairmen and Brethren of all the Lodges within the District to create an environment where all of us can meet with harmony to the deliver on the responsibilities that our rich fraternity offers. Buchanan Lodge Official Visit Speech - Is This All We Do? Wardrope Lodge Official Visit Speech - Light!